It’s probably safe to say that most Devour readers fall within that 10 percent of folks in the know. 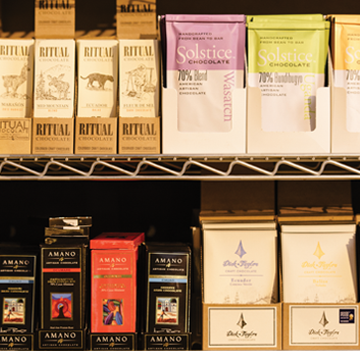 After all, Utah is home to some of the world’s top chocolate makers, purveyors and experts, with internationally award-winning brands like Amano, Solstice and Ritual made right here along the Wasatch. 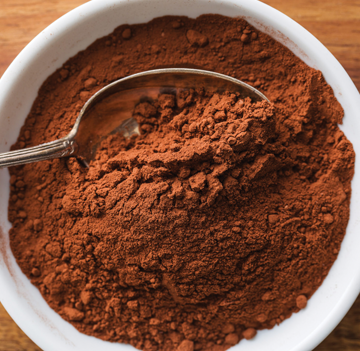 “Utah is the epicenter of cacao connoisseurs,” food educator and writer Vanessa Chang says. And that’s for both chocolate-makers and discerning consumers. Seconding that notion, in 2016, Saveur magazine published an article titled, “The Craft Chocolate Capital of America is … Utah?” Yes, Utah. So, what separates “craft chocolate” from mass-market sweets? Unfortunately, the chocolate industry overall isn’t doing consumers any favors with education and labeling standards. As Caputo laments, there’s very little actual cacao present in most industrial chocolate bars, including those labeled “dark” chocolate. Even cacao percentage numbers touted on wrappers say relatively little about what’s inside besides the weight per bar that comes from cacao beans (including cocoa butter and cocoa solids from the fatty and non-fat parts of the cacao bean). Rebecca Millican, pastry director of the Park City Culinary Institute, helps clarify some of the biggest misconceptions about chocolate covered in the institute’s multi-week pastry program. She emphasizes that even within categories like “dark” or “milk” chocolate, there’s a huge range of quality, flavor, sweetness and intensity. With beans sourced from specific regions around the globe, “You find very unique flavor profiles in single-origin chocolates, as each variety of bean has different flavor characteristics,” she says. “The manufacturer’s skill in roasting the beans comes into play as well. We could taste a dozen different bars, all with an identical cacao content and find that no two bars taste the same.” In addition to roasting, the amount of fermentation the beans go through during initial processing as well as the chocolate-making steps (like conching—stirring or mixing the chocolate with heavy stone rollers) play a huge role in flavor, smoothness and that incomparable “snappy” texture found in superlative chocolates like Park City’s Ritual. Several of Utah’s award-winning chocolate makers have built their brands and reputations around responsible cacao sourcing and respect for ingredients. In Salt Lake City, Millcreek Cacao owners Dana Brewster and Mark DelVecchio call their shop a “farm-to-bar” chocolate company, working directly with farmers in Ecuador and Nicaragua dedicated to using sustainable practices and paying living wages. Connecting the story of cacao growers to the final single-origin bar is just one part of the education process, Ruggles says. From that point on, he recommends that the only way to truly develop a discerning palate for fine chocolate is to taste, and taste a lot. “Blind test to figure out what you like. Be mindful. Engage all five senses,” he advises. Case in point, Ruggles invited me to a Utah Chocolate Society meeting, scheduled roughly once a month at the Caputo’s downtown store, which Ruggles calls the “chocolate mothership.” Founded in 2010, about 40-60 regulars of the several hundred-member group hone their chocolate palates with blind single-source tastings curated by Ruggles, and an annual tasting tournament. Local chocolate makers sometimes drop in to share their works in progress. Guest pastry chefs like Alexa Norlin and Amber Billingsley have made popular presentations to the group, often keeping in mind what Ruggles calls “Mosher” ingredients (caffeine- and alcohol-free in deference to the many LDS members). 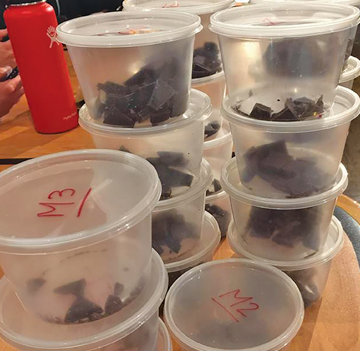 Vanessa Chang calls Ruggles and crew, “the chocolate intelligentsia.” And they’re not just recognized as legitimate cacao aficionados in Utah, but also among national chocolate authorities. When I attended a “Choc Soc” meeting a few months ago, Ruggles started out the evening with a blind tasting of eight single-origin Tanzania-sourced cacao bars. He passed around unmarked samples, and after tasting each we speculated on the maker and the presence or absence of cocoa butter, vanilla and other ingredients. Ruggles followed the discussion by circulating the bar wrapper—one of his picks was Utah-made Solstice 70 percent Kilombero Tanzania redolent with honeysuckle and amari notes—and provided some background research on product components and sourcing issues specific to Tanzania. Sure enough, the sample was redolent with bright raspberry and new-car leather. Very different from the bitter astringency present in the Tanzanian chocolate we’d been tasting. 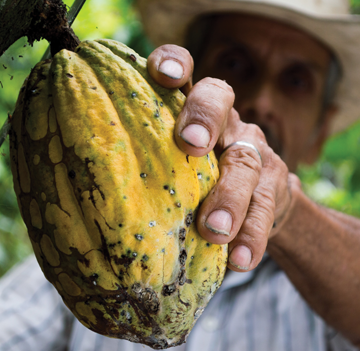 Ruggles had shifted the cacao origin to emphasize a distinctly different terroir by adding an Amano Morobe into the mix, to the resounding delight of the group. A Sample of the Beehive’s Best Bean-to-Bar Chocolates. “Utah chocolate is the bomb,” award-winning pastry chef Alexa Norlin says. “I’ll always use it first.” Utahn’s love for the best of the cacao bean also means that we have the luxury of sourcing some pretty amazing single-origin bars right at the neighborhood grocery store, with Liberty Heights Fresh, Urban Farm & Feed, Harmons markets and Caputo’s downtown shop leading the way. Here’s a small sample of the best bars in the Beehive and where to find them. The go-to chocolate for internationally acclaimed restaurants like Berkeley’s Chez Panisse is made in an unmarked warehouse in Orem. Having won nearly 200 awards since it was founded in 2006, Amano Artisan Chocolate’s Art Pollard likes to keep his trade secrets a bit of a mystery in the competitive community. Full of intense flavor and velvety cocoa-butter nuance, Amano is an absolute local favorite. New kid on the chocolate block The Cacao Bean Project often wood-smokes their cacao beans instead of traditional roasting. 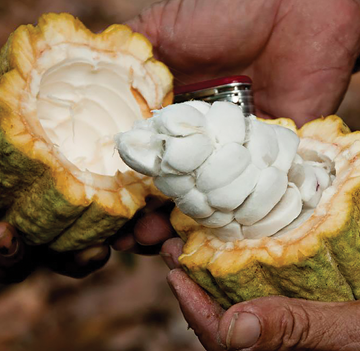 “Using different woods to complement the natural cacao provides an additional flavor experience,” chocolate maker Lance Brown says. Think cherry-wood-smoked-cacao from Tanzania and hickory-smoked 74 percent cacao from Madagascar. As a small-batch cottage producer, Brown encourages people to find their products at farmers markets in the south valley and at the Urban Farm & Feed Store in Sandy. The Chocolate Conspiracy’s AJ Wentworth makes un-roasted raw chocolate bars, truffles, smoothies, sauces and other products influenced by his nutrition background in raw-food cuisine and vegetarian practices. While Chocolate Conspiracy bars are sweetened with raw honey, Wentworth also makes completely vegan truffles, all available at their cozy shop. For the cacao-curious, Wentworth and/or company owner Steve Ohlson teach an Intro to Fine Chocolate class featuring 10-15 chocolates from around the world You can register through their website. With a solid reputation as a “chocolate geek’s chocolate,” Durci Chocolate has a passionate and loyal fan base in cacao-crazy Utah and beyond. 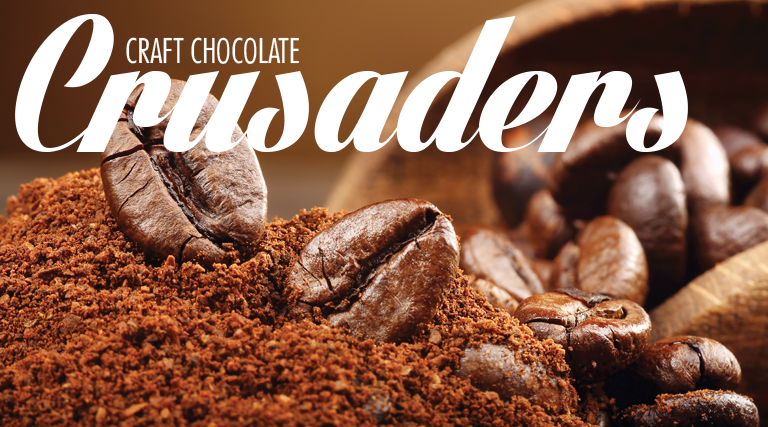 Owners Eric and Cassandra Durtschi started Durci following the success of their line of roasted cacao beans blended as a coffee alternative, Crio Bru. 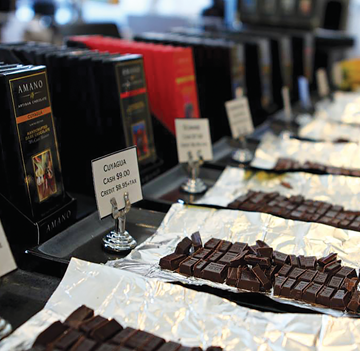 Find Durci Chocolate at all Caputo’s Market and Harmons locations. In addition to making small-batch single-origin bars, Millcreek Cacao is also unique in the industry for their infused chocolates, which impart a subtle aroma and flavor without inclusions. One of Millcreek’s most popular bars features 70 percent Chuno cacao from Nicaragua infused with High West Double Rye! whiskey. Ritual Chocolate owners Robbie Stout and Anna Davies credit Park City as a near-ideal location for chocolate production. Davies says, “We don’t have to worry about triple-digit temperatures and there is no humidity,” crucial for achieving that distinctive Ritual chocolate “snap” and spectacular gloss. At Ritual Café, try their chocolates served as hot or cold drinks and watch ongoing chocolate production through the large-paned window separating the café and factory. You’ll carry the delicious fragrance of cacao with you for the rest of the day. One customer told Solstice Chocolate owner/chocolate maker DeAnn Wallin that eating Solstice Chocolate was “like a party in her mouth.” It’s a love-at-first-bite sentiment that’s struck many a chocolate fanatic. In fact, so many local chefs use award-winning Solstice that it’s next to impossible to single out any one Solstice bar as a foodie community favorite. One of Solstice’s biggest draws, according to local pastry chefs, is Wallin’s commitment to consistency across the board, with her white and milk chocolates having as much depth of flavor as Solstice’s darks are known for their brightness.